Latkes are potato pancakes. They are traditional at Hanukkah, but may be eaten at any holiday. They are usually made with russet potatoes, but you can make a substitution in this recipe. I make sweet potato latkes and include two tablespoons of lightly sautéed scallions. I like the balance of the savory and sweet. This is a tweaked version of the traditional recipe, flash roasted in the oven instead of shallow fried in chicken fat or schmaltz. If you use lower sodium chicken broth for the puree, you get the flavor of a latke fried in schmaltz, or chicken fat without the added fat. The Rosh Hashanah menu posted is herbed brisket, saffron couscous with chickpeas and tsimmes in the Essential Puree Guidebook. Some people like potatoes with brisket, so you can make either the russet potato latke or the sweet potato latke. I also offer a recipe for homemade mashed potatoes that is delicious. If you prefer, you may serve mashed potatoes instead of latkes. Tip: For a second meal, leftover latkes are delicious when served for breakfast with scrambled eggs. If you wish to make latkes for a family, as well as the person with a swallowing disorder, please double the recipe. You will need a spiralizer with either a hand model or an electric attachment for a Kitchen Aid stand mixer (the Rolls Royce of spiralizers). You can also use a box grater, a food processor with a shredding plate, or a mandoline with a ribbon plate. 3 small russet potatoes, peeled, 2 lbs. Spiralize the potatoes on the finest setting. When you have the long strings, cut them up into half inch pieces. I prefer this method to shredding with a box grater, but go ahead and shred if you are a traditionalist. Potatoes will give up liquid, no matter which prep technique that you use. Chop the onion or dice it on a mandoline or a food processor. If you use a box grater, you will cry. Place onions and potatoes in a sieve, rinse and squeeze out the excess water with the back of a big spoon. Or place onions and potatoes in a square of cheesecloth and squeeze out the excess liquid. In a bowl, place onions, potatoes, eggs, salt and white pepper, flour and matzoh meal and mix. Bake 15 minutes; turn latkes; bake 10 minutes longer. Tip: Do not bake the latkes until they are dark brown. Take them out of the oven when they are lightly golden and still soft, but cooked. The object is to develop the flavor, not to get a crisp exterior. The crisp exterior in the traditional latke is not safe for the swallow. Turn the oven down if the latkes begin to brown too deeply. Cook for a minute or two longer on a lower oven temperature to make sure the potatoes and onions are thoroughly cooked. It is possible to prepare the latkes in the traditional manner by frying them, but they retain a lot of oil and the oil does not create a good puree texture. Add 1/4 cup of chicken broth. 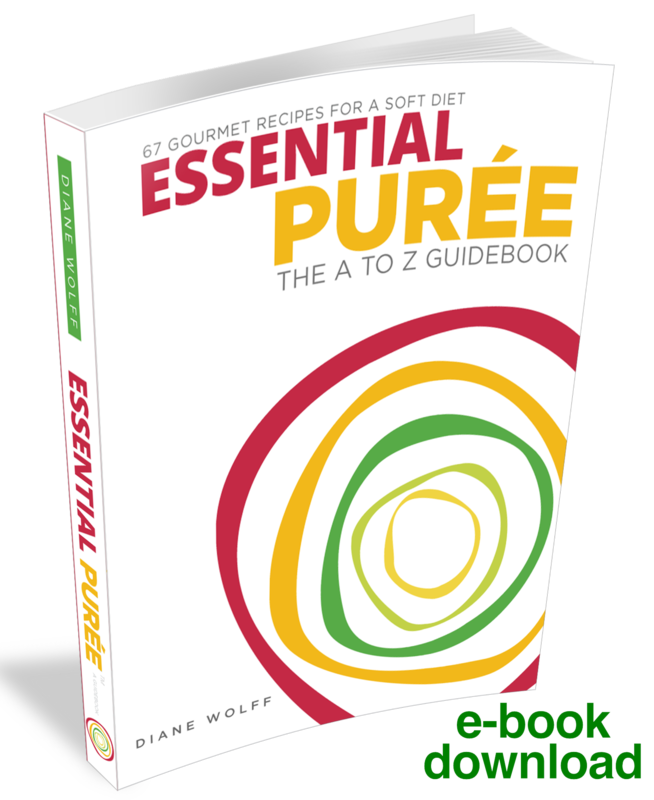 Pulse seven times to incorporate ingredients. Add more broth one tablespoon at a time, if needed. I found that adding Instant Thickener was not necessary, as the potatoes were of the correct pudding consistency with the addition of broth. Add a pump of instant thickener if it suits your palate. Serve with applesauce, sour cream or both. I put the latke puree in one bowl. Applesauce in a second bowl. Sour cream in a third bowl. The person can use the applesauce and the sour cream as dipping sauces, as both are of a pudding consistency.